When Chrysler executives said they were going all out for the new Dodge Durango, I didn't expect this, too. 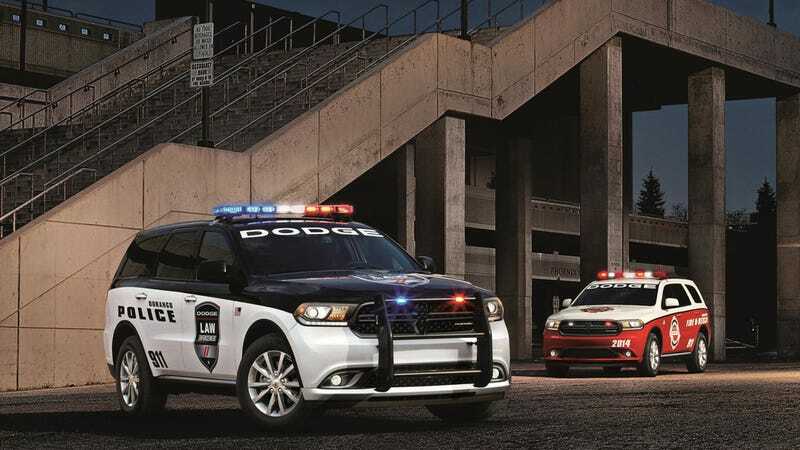 On top of a mid-cycle refresh, a boost in production and arguably the year's best ad campaign (so far), now the Durango is being shopped to law-enforcement agencies. Funny thing is, I could've sworn the Durango was already a police vehicle. I'm 100% sure I saw a brand new Durango with flashing grille lights a few weeks ago on the Lodge service drive in Detroit at the Chicago Boulevard exit. Maybe Chrysler was testing it. But here's the official word on what their plan is. The Durango Special Service cruiser adds load-leveling suspension, tougher brakes, a better battery and a 22o-amp alternator. It can also tow 7,400 pounds. What Chrysler hasn't told us is how fast it goes. We know the Charger cruiser's lap times, and we know Ford is challenging those. But we don't have anything for the Durango to compare to the Tahoe or Explorer. Until we get those numbers, Chrysler is taking orders now and you can have yours by the end of the year.